A drawing tool, inspired by PETSCII and live-drawing in front of an audience. Shout out to Raquel Meyers for being a constant source of inspiration! In drawing mode, use cursor-keys to navigate, button 1 and cursor-keys select tile or color, button 2 draws. 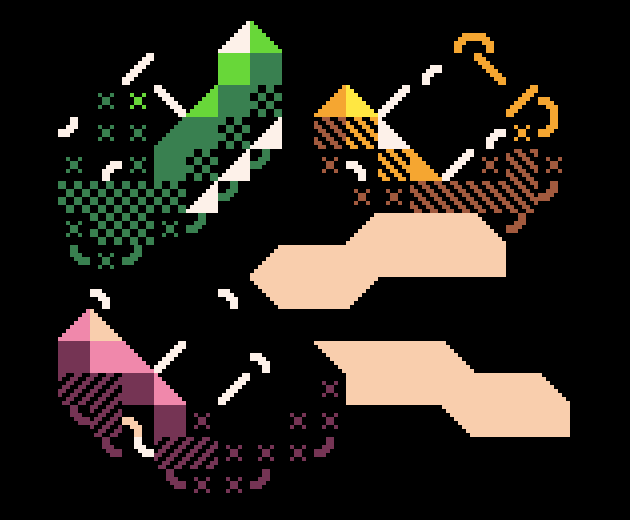 This is a very first version, I think there will be lots of experimentation with "fantasy charsets", that are not directly related PETSCII or better control of color. Just a tiny, tiny update at the controls. When selecting a tile, it can be only selected by Button O. (Before you could select by O und X. But this made things sometimes really confusing, when going instantly to drawing by pressing X). It would be cool if it used more buttons to do things, rather than holding buttons down and pressing cursors? Would be faster to operate, especially if you have a key-mapped gamepad connected. Iterating quickly with pico-8 is really fun. Here is v0.02 with an enhanced "select-drawing-tile" menu.